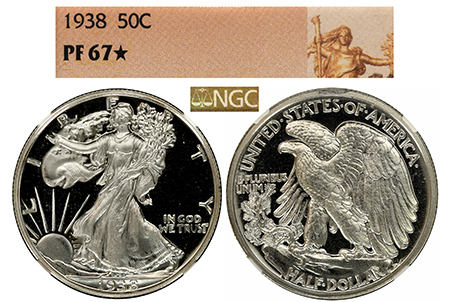 Few 1938 Walkers come through our door with deep, haze-free mirrors and a cameo obverse AND reverse! Just missing that Cameo grade, this 1938 boasts deep, jet-black mirrors and pristine surfaces that are so ridiculously rare among Walkers! Liberty is coated in snow-white frost, and the Eagle is glowing in bright-white to really pop off the fields! Absolutely PHENOMENAL eye-appeal and RARE Walking Liberty qualities that are extremely hard to come by. Only 18 examples in existence!! !